This document gives a broad high-level overview of what Native Client is and how it fits into the world of web browsers and plugins (Chrome in particular). It is intended for anybody who wants to learn about the background and concepts behind Native Client, from browser technology fans, to pontential project contributors, to NaCl module developers. Chrome is a multi-process browser. It uses multiple processes to provide increased security comparing to other single-process browsers like Firefox. The main process is called "browser". It runs the UI (including the Omnibox) and manages tabs and plugin processes. It has full permissions of the current user for accessing resources (files, network, etc) and can fork-exec other processes. Tabs are allocated into separate processes, typically shared per domain. These are called “renderer” processes. Renderer interprets the HTML layout and handles the bitmap for displaying the page. It runs in a sandbox (known as Chrome or outer sandbox) and has limited access permissions. It cannot open files or network connections and can only respond to communication requests by the browser. Communication is done via a combination of IPC techniques. Using sandboxed renderers ensures that if one tab misbehaves or crashes, the rest of the tabs and the browser are isolated. It also limits the ability of malicious software running in one tab from accessing activity in another tab or interacting with the rest of the system. Plugins are external binaries that add new capabilities to a web browser and are loaded when content of the type they declare is embedded into a page. They either come bundled with the browser or get downloaded and installed by the user. The most common plugins are Adobe Flash, Adobe Reader and Java. In general, existing plugins cannot be sandboxed like the render process because they rely on file system and network access as well as use of native fonts. Therefore, Chrome supports out of process plugins that run in a separate process with full privileges (i.e. no sandbox) and communicate with the renderer and browser via IPC. Chrome also supports in process plugins. They run within a render process and can use faster direct access for communication. They have also been used as an integration mechanism for adding new statically linked functionality to the browser. NPAPI is a common cross-browser plugin framework used by plugins for exchanging data with the browser. It is implemented by Chrome, Firefox and most other web browsers, excluding MS Internet Explorer, which stopped supporting it in favor of ActiveX. Contrary to other single-process browsers, Chrome supports NPAPI plugins out of process. While this improves stability, security is still an issue - even in Chrome, NPAPI plugins have full permissions of the current user to access resources and fork-exec new processes. Although NPAPI is intended to be platform independent, in reality it is not fully so. NPAPI is a weak "standard", and every browser implements it somewhat differently. Moreover, NPAPI plugins end up relying on OS and browser specifics for certain capabilities, such as 2D or 3D graphics events. Even keyboard and mouse events typically use the native OS implementation. It can also be difficult to achieve similar rendering of the plugin area within a page across different systems. Pepper started at Google as a way to address portability and performance issues with NPAPI, particularly for out of process plugins. The initial focused efforts eventually expanded to include capabilities such as generic 2D and 3D graphics and audio. The first Pepper API designs were created to minimize the changes from legacy NPAPI, hoping to ease adoption by browser vendors and plugin developers. This design was implemented and is available to NaCl modules in Chrome 5. The Pepper APIs were redesigned subsequent to the initial design, deviating more substantially from legacy NPAPI while, hopefully, also improving the interfaces. The revised interfaces are sometimes referred to as “PPAPI” or “Pepper2” and should be available in Chrome 6. Although traditional NPAPI plugins in Chrome run only out of process, Chrome 5 supports Pepper plugins only in process. Being a somewhat experimental feature, the only way to load trusted Pepper plugins is through the browser command-line options. In the future, Pepper plugins will only be supported within Native Client. Native Client is a sandboxing technology for safe execution of platform-independent untrusted native code in a web browser. It allows real-time web applications that are compute-intensive and/or interactive (e.g. games, media, large data analysis, visualizations) to leverage the resources of a client's machine and avoid costly network access while running in a secure environment with restricted access to the host. Native Client SDK is a software development kit for creating Native Client executables (abbreviated as nexe) from scratch or from the existing platform-specific web-based native applications. It consists of a GNU-based toolchain with customized versions of gcc, binutils and gdb (32-bit x86 only), precompiled API libraries and various examples and how-tos. The two usage models include porting desktop apps and extending web apps with fast native code. Naclports is a collection of ports of various open-sourced projects (like zlib) to Native Client for gradual up-streaming. It is still in early stages of development and is intended to be modeled after Macports. 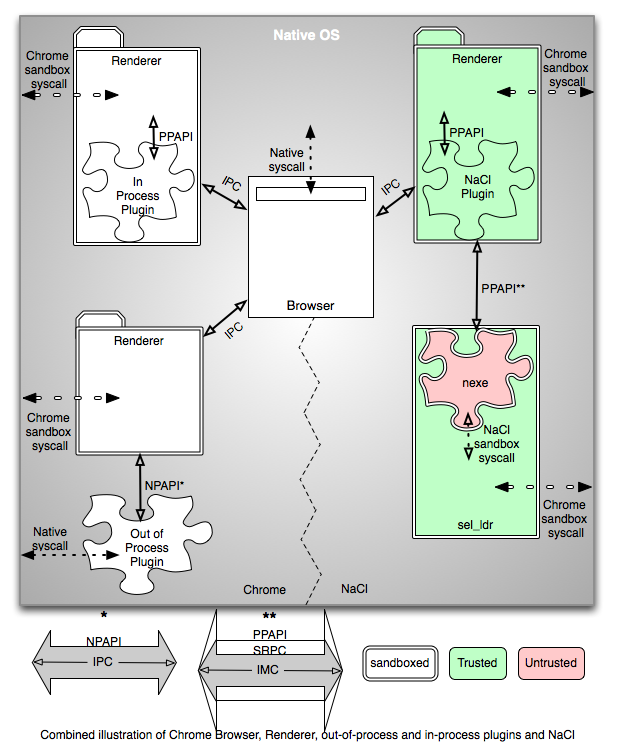 NaCl started as a downloadable NPAPI plugin for multiple browsers, including Firefox, Safari, Opera and Chrome and was designed to transparently load and run other NPAPI plugins compiled as nexes and embedded into the page as a source file of an plugin element with “application/x-nacl-srpc” type. NaCl includes a "service runtime" subsystem that provides a reduced system call interface and resource abstractions to isolate nexes from the host. It provides a POSIX-like environment for nexe execution and is used by nexes to communicate with each other and the browser. The nexes are run using a loader program, sel_ldr (secure ELF loader), which is launched as a separate process. The sel_ldr process communicates with the NaCl plugin via SRPC over IMC . NaCl was integrated into Chrome 5 as an in-process Pepper plugin. The NaCl modules that it runs can utilize the Pepper API for browser interaction. Part of the integration was to add special support to Chrome to allow sandboxed plugins to launch the sel_ldr process. NaCl can be enabled in Chrome 5 and later with the --enable-nacl command-line flag at browser start-up by developers who want to develop Native Client modules. From Chrome 14 and onwards Native Client is on by default and can be used in Chrome Web Store apps. For development purposes Native Client is also available to unpacked extensions. Once we launch Portable Native Client (PNaCl) (PDF), we plan to enable Native Client for web pages in general (i.e., not limited to Chrome Web Store apps). In the presence of a sandbox environment, trusted code runs outside of the sandbox and can perform privileged operations while untrusted code is prohibited from doing so by the enclosing sandbox, which isolates potentially misbehaving or malicious software from the rest of the system. Within the scope of Native Client, whether code is untrusted or trusted depends on whether it will run inside of a NaCl sandbox (regardless of any outer sandbox). The code that implements the sandbox abstraction is trusted. The code that the sandbox hosts is untrusted. Untrusted code is built using NaCl SDK or any other compiler that outputs binaries that honor alignment and instruction restrictions and can be validated by NaCl. NaCl will statically verify that nexes do not attempt privileged operations and therefore do not need to be trusted. To summarize, the traditional NPAPI plugins running out of process and outside of any sandbox are considered trusted. The in process Pepper plugins running within the Chrome sandbox are trusted with respect to NaCl. And the out of process plugins (that must run inside Native Client) are untrusted. NaCl's sel_ldr process is trusted and can do Chrome sandbox system calls on behalf of the untrusted nexes running within it. Important: this section is kept for historic purposes, but is no longer being updated. For news and announcements see the SDK site at GoNaCl.com and the announcements list.